9.25x12 inches. Finnish - Swedish - German. Melartin was also a prolific writer of songs of rare stylistic diversity, ranging from lyrical, nature-inspired mood pictures to impressionistic and at times even highly expressionistic pieces. His choice of texts reflects his broad education, for he was equally at home in both Finnish and foreign poetry. 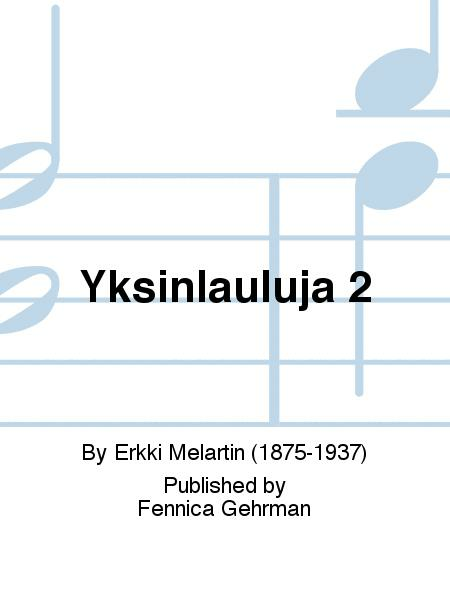 The selected songs by Melartin (edited by Matti Tuloisela) are in two volumes. Volume 2 examines his vocal output from a broader stylistic and linguistic perspective. 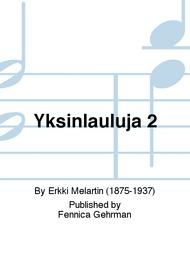 This volume also contains a number of rarer songs in languages other than Finnish with Finnish translations. Contents: Morgonsang / Aamulaulu Marias vaggsang / Marian kehtolaulu Oi Herra / O Vater / O Herre Indisches Lied / Indisk sang Lied von Paul Verlaine (La lune blanche) / Sang av Paul Verlaine Rosa rorans bonitatem Kristuslapsen kehtolaulu / Kristusbarnets vaggsang / Christkindleins Wiegenlied Angoisse / Angest / Tuska Hvorfor / Warum / Miksi Ro / Rauha Host / Herbst Gib mir dein Herze / Suo mulle syommeis / Giv mig ditt hjarta Mademoiselle Rococo Recordare / Rukous / Bon November / Marraskuu Bon om ro / Rauhan rukous Kiitoslaulu (Lovsang) Kys mig paa Ojnene, Sol / Kuss mir die Augen, o Sonn' / Kyss mig pa ogonen, sol Det forsta regnet / Kevainen sade Vom Rosenquell / Rosenundret / Ruusulahteella Varmorgon / Kevataamu Fageln i parontrad / Istut, lintunen oksallas Paddan / Sammakko Maggiolata / Kevatlaulu Ritorno / Paluu / Hemkomst Tjugo ar / Kaksikymmenvuotias Tili tili tengan loysin Een gammall boord-Vijsa / Wanha kestilaulu.